Andy Broussard, the plump and proud medical examiner for the City of New Orleans, is sitting almost in the kill zone of a too-close-for comfort and ‘in living color’ murder of his Uncle Joe Broussard at a family picnic in Bayou Sauvage – the largest urban wetlands park in the USA. Surprisingly, the murderer then immediately commits suicide. After easily determining the killer’s identity from the driver’s license in his pocket, the only remaining task for Broussard and the police is to uncover the motive for such a heinous act. But suddenly, everything about the case takes a bizarre turn. Caught short handed because of an NOPD work slow-down, and needing someone to find out what happened to a young woman who has just been reported missing, Homicide Detective Phil Gatlin deputizes Broussard’s beautiful death investigator, Dr. Kit Franklyn, and assigns her to that case. Shockingly, Kit’s efforts soon lead back to the murder of Uncle Joe. Sensing a plot of horrendous magnitude, Broussard directs his colleagues and friends in a race to uncover the truth behind the most audacious Andy and Kit mystery of the entire series. Donald (Don) Jay Donaldson, who also writes as D. J. Donaldson and David Best, was born in 1940 and is now a retired professor of Anatomy and Neurobiology. He holds a Ph.D. in human anatomy and his entire academic career was spent at the University of Tennessee, Health Science Center, where he published dozens of papers on wound-healing, and taught microscopic anatomy to thousands of medical and dental students. He lives in Memphis, Tennessee with his wife and two West Highland terriers. In the spring of most years he simply cannot stop buying new flowers and other plants for the couple’s prized backyard garden. He is the author of five medical thrillers and eight forensic mysteries, the latter featuring the hugely overweight and equally brilliant New Orleans medical examiner, Andy Broussard, and his gorgeous psychologist sidekick, Kit Franklyn. Of these it has been said that they contain ‘lots of Louisiana color, pinpoint plotting and two highly likable characters’, whilst the Los Angeles Times states ‘the autopsies are detailed enough to make Patricia Cornwell fans move farther south for their forensic fixes ….. splendidly eccentric local denizens, authentic New Orleans and bayou backgrounds’. For long-standing fans of Andy Broussard and Kit Franklyn, what can they look forward to in the latest installment? There are a couple of humorous scenes between Andy Broussard and his little Cajun friend and mechanic, Bubba Oustellete, that still make me chuckle when I read them. Of course, I’m totally unbiased in my judgement about that. We also learn something about Grandma O that even Broussard didn’t know. Finally, in the last chapter, there’s a big development in the relationship between Kit and her boyfriend, and frankly, I’m worried about what that means for me. For new readers, what should they know before jumping in? It would be great if someone new to the series could read the first seven books before reading the new one. But that certainly isn’t necessary. Each book is designed to serve as a stand-alone introduction to all the characters. How do Broussard and Kit develop throughout this book? How does this particular case push their limits? Broussard is faced with the fact that he is such a self-contained man he hasn’t kept contact with any of his relatives. That includes his murdered Uncle Joe and Joe’s now adult children, with whom Broussard grew up. Amid his feelings of guilt over ignoring those who helped him after his parents were killed, Broussard must now investigate the possibility that one of them killed Joe. Kit and her alligator farmer boyfriend, Teddy LaBiche, move to a higher level in their relationship. Will that be a good thing or not? 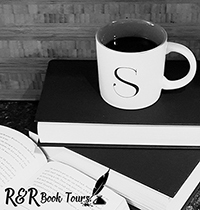 At the same time, in her newly appointed capacity as a detective, assigned to find a missing young woman, Kit knows that if she doesn’t figure things out fast, the girl may die. Can you tell us a little about your background in science and how it has influenced your writing, especially since Broussard is a medical examiner? I’ve never been a medical examiner. But at the University of Tennessee, where I was professor of anatomy for many years, the county medical examiner and several forensic anthropologists were my colleagues. That gave me pretty free access to the forensic center, where I got to hear about a lot of fascinating cases, some of which I’ve used in my books. What was your favorite part about writing “Assassination at Bayou Sauvage?” Did your characters surprise you at all? I love working esoteric medical and scientific situations into my books. I don’t want to give anything away, but there’s a really good one at the heart of this story. Kit and Teddy didn’t surprise me in this one, but they’re pushing me toward a development I can’t seem to stop, but may not be able to handle effectively in the future. What makes the New Orleans area the perfect setting for a murder mystery? The beauty and ominous nature of the swamps, the distinctive food, music, and French heritage, along with a high water table that leads to creepy above-ground cities of the dead are consummate ingredients that can’t be duplicated by any other American city. What’s next for Broussard and Kit? Like the night sounds of the swamp, I can feel that there’s something out there, but don’t yet know what it is. I love this series and was so excited to read Assassination at Bayou Sauvage. This book does not disappoint. Andy is still enjoying the finer things in life when puzzling over a supposedly cut and dry murder/suicide. This makes Andy realize a lot about his own behavior with his own family. Kit also has her hands full and finds herself in a lot of trouble with her own investigation comes full circle to Andy’s. If like great mysteries that will keep you guessing until the end and a lot of great medical procedures, look no further. This is a great series, one of my all time favorites. You can read all the books as a standalone but of course they are better when you read them in order. 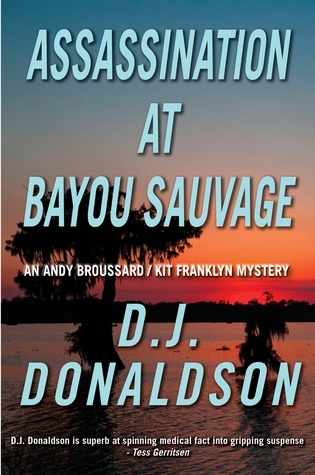 I received Assassination at Bayou Sauvage from JKS Communications for free. This has in no way influenced my opinion of this book.